Capturing the essence of the castle and epic location from the air is not as easy as you think, I will add some airviews and background as my blog addition. Like this idea a lot Gary! Aerial shots of the castle are some of my real favourites and we don’t get to see as many as I’d like. I’ll create the new page tomorrow and contact you again as to your content and material. Many thanks! For sure would be great to see such. Didnt have the opportunity to take as many as I would have liked during recent visit. Hmm theres always next time, although my partner might make me take more conventional transport. It’s on Gary. I put it on last week. Look under the new “Guest Author” page. Hi there, so I was reading these posts and I had a silly Question. Can this castle be lived in or passed down to someone? I know it’s a weird question but I am curious about the heritage of it and generations to come. Hi Katie, the MacRae family who own the castle and who are direct descendants of John MacRae-Gilstrap, (the person responsible for its reconstruction) don’t live here permanently, but still use the family apartments for 3 or 4 months each year. Isn’t the castle held in trust? Yes Deborah, it’s operated by Conchra Charitable Trust. 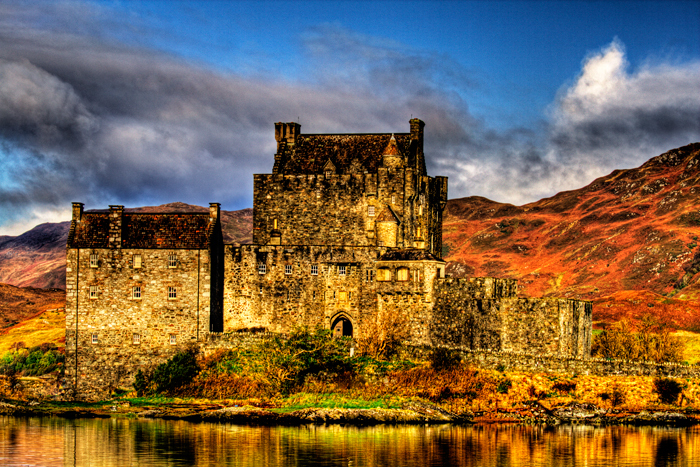 Not of Scottish ancestry, but I LOVE Scotland and its castles in particular.. plus the food, the customs, the clan histories(bloody and all)… My house a veritable museum/library of as many Scots items as I’ve managed to accrue in over 20 years…MY TOP fave, and I hope Alex doesn’t get in trouble for this, …is a tile in the MacRae tartan which Alex gave me as a memento of my last visit to the castle in 2007. When he told me I couldn’t leave without a memento, I expected a small stone or sliver of wood… but he presented me with a small leftover tile…I was so touched. I still cry when I think about it. My niece and I had spent almost two hours with Alex asking question after question. He took us to see the Laird’s Secret Chamber and we peeped down to the Great Hall… and went doon to the well…Looked at stalactites and stalagmites….dropped little pebbles into the well… and Alex showed his fine legs under the kilt! LOL Needless to say, the tile was wrapped most carefully in multiple layers of fine undies and socks in my suitcase! It is my proudest possession and holds place of honour shadowboxed on my bedroom wall. it’s the last thing I see whenever I go to bed at night…. the first as I get up in the morning! BTW, is there a way to see what the gift shop has for sale? I can’t find a link anywhere! I saw the well about two years ago. It was amazing at that time. I can hardly believe the difference that removing the ivy has made. Wonderful photos!